After an amazing trip to Portland and Willamette Valley, I jumped at the invitation from my sister to travel to another well-known city: Bend, Oregon. Bend is located at the eastern edge of the Cascade Mountains in southern half of the state. After a seamless trip aboard the Monterey Airbus to San José’s airport, I made the trip to Portland and caught a super quick flight to the very impressive Redmond Airport, which has easy transportation access and a small USO, which was surprising given its relatively small size. From the Redmond Airport, it’s about a 45-minute drive into the city of Bend, with scenic views to pass the time. Our first stop was for a delicious hamburger lunch at the legendary Deschutes Brewery and Public House in downtown. The company is based out of Bend and it namesake stems from the Deschutes River that runs through the area. Although the city of Bend was lovely and and I wish I were able to explore more, our purpose for traveling was to attend a wedding held at the picturesque and pristine Brasada Ranch in Powell Butte/Bend. This was my first experience with a resort that can be described as a luxury ranch. The winding roads through hilly farm and ranch land presented us with views of Brasada from afar, and my first thought was how lucky I was to be asked to experience this place for the weekend. The property is designed to encompass the expansive mountain views while preserving comfortable rustic details throughout the design of the cabins and common areas. Brasada offers high end experiences in golf, equestrian activities, and spa treatments. We explored wonderful farm-to-table food options at the Range Restaurant and Bar, as well as the Ranch House. The chefs here provided the best wedding rehearsal and reception dinner selections that I have ever attended. The wedding venue on the property was exquisitely decorated and arranged for a very fun and enchanting evening. Although we did not spend time there with our children, it was evident that Brasada would be an amazing summer vacation for families or even family reunions. The resort-style pools were perfectly placed to take in the views of the Cascade Mountains, while the community fire pit offered delectable homemade s’mores fixings. 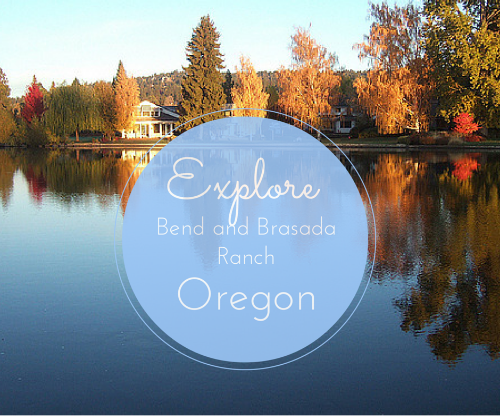 It would be a shame not to mix Portland into a visit to Oregon, but a vacation to Bend and Brasada would certainly be a worthy departure from the routine of military life. Members stationed from Central California up to Joint Base Lewis-McChord, Washington have a great opportunity to make the easy trip and explore what both have to offer!